General Description: The Cotaco Creek type is a medium to large sized, well made, broad, triangular bladed, stemmed point with rounded to square shoulders. The blade edges usually have fine serrations and many examples have blunt tips. The stem can be either straight or expanding. The stem can have incurvate side edges. The basal edge of the stem is usually thinned with detailed flaking scars and is often slightly excurvate or straight,. 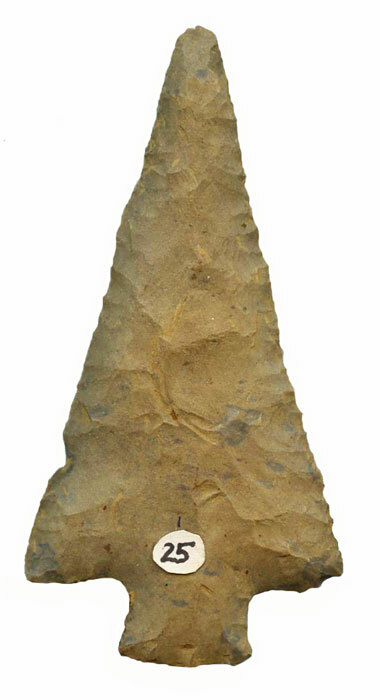 It is suggested that the Cotaco Creek blade served duty as a knife and projectile point and many reworked examples were often reduced into drills. The type has been recovered from numerous sites (Stanfield-Worley Bluff Shelter, Flint Creek Rock Shelter and the Flint River Mound) and has been recovered in association with Wheeler fiber-tempered ceramics. Baker discusses five additional sub-types of the Cotaco Creek (type II, Asymmetrical, Broad Stem, Long Stem, and Narrow Stem). The size of the Cotaco Creek point ranges from 37 mm to 83 mm in length, with the blade width being between 30 mm and 44 mm. The stem length is usually between 10 mm and 12 mm and the stem width is between 17 mm and 20 mm. Typical mid-blade thickness is between 7 and 8 mm. The Cotaco Creek is found in Alabama, Tennessee, the Carolinas and Mississippi. The point was named by James W. Cambron, David DeJarnette and Edward Kurjack for examples which they recovered from sites along the Cotaco Creek in Morgan County, Alabama.